Doggieville Ranch is a social daycare and boarding getaway for dogs. Don’t call them a kennel because, after all, they are an exclusive B & B (Bed & Biscuit) for your pampered pooch. They take a limited number of dogs by appointment only so your dog doesn’t get lost in the crowd. Doggieville describes itself as a 5.5 acre “doggie amusement park” and they’re not really kidding. It’s got a swimming pool, hiking trails and cushy accommodations. 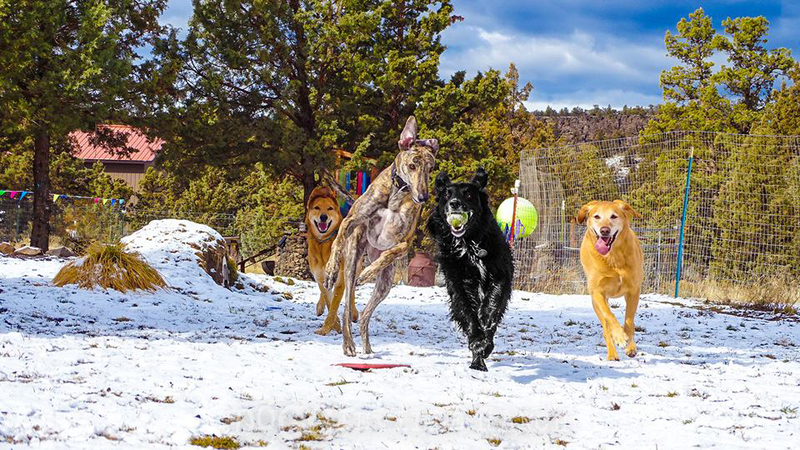 This doggie daycare, boarding and training facility allows dogs to be free to be dogs. It’s a safe place for your dog to come exercise, socialize and build character, with a large indoor/outdoor area where your dog can run and play off-leash. explore, and make new friends, all while supervised by professional staff. Doggieville Ranch is an alternative to traditional kennels; it’s for well-socialized dogs because they are 100% cage free! Your dog can enjoy wide open spaces, 24/7 supervision, and all day play.